Let's see now, the start of the NBA playoffs Saturday. Check. The NHL conference semi-finals begin (tonight in Phoenix). Check. The NFL draft has six rounds to go. Check. MLB is finishing its first month of play. Check. And, in PLA's Philly hometown, it's the Penn Relays Saturday at Franklin Field, where crowds regularly exceed 50,000 in the 117-year old facility to watch many of the the nation's, and world's, top track and field athletes. The 'Carnival' was named last month by 12 longtime Sports Illustrated writers as one of the top dozen sports fan experiences to attend in North America. Whew. Where should one turn his/her attention this sports weekend? Besides the Penn Relays, Philly sports fans are all over the place because only their city, New York, and L.A. still boast teams playing in both the NHL and now NBA playoffs, on top of the aforementioned draft in New York, and a rare April home appearance at 'The Bank' by the Phillies with a weekend series against the Cubs. Authentic Store Buzz: It's still mainly Flyers...Flyers...Flyers...especially with the interest among women wanting to purchase jerseys and other accessories to help cheer the team on in its match-up with longtime rival New Jersey, but the 76ers legion remains optimistic for a strong showing in a '1 vs. 8' meeting with Chicago, and we have select authentic merchandise (see above) to put Sixer fans in a rooting mood for the Bulls series. For 'Fly Guys,' Wright & Ditson great looking Flyers Tee's hit Wednesday, they are proving quite popular. Official New Era Eagles draft caps are also available. 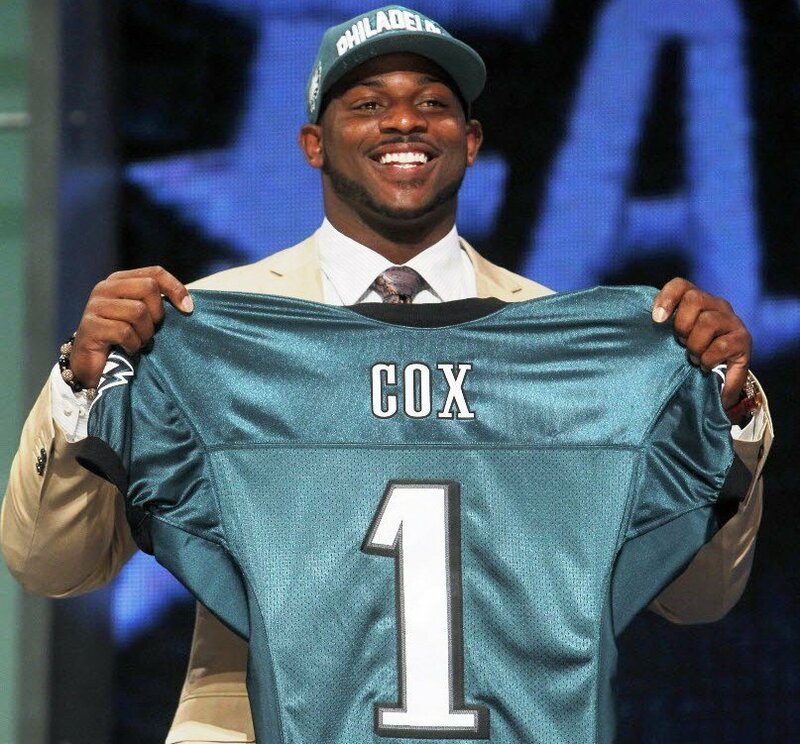 Birds first-round selection Fletcher Cox, the defensive tackle from Mississippi State, sported the green model (see above) on stage last night in New York after being taken with the 12th overall pick. Speaking of caps, 1980 Phillies pre-curved, visor fitted caps are in stock from American Needle. Coming Up: A reminder, if you haven't heard, on Thursday, May 10 is the next date of Pro League Authentics four-part exhibition series "Jerseys as Art." The second installment features former Mitchell & Ness president and throwback uniform expert Peter Capolino discussing and exhibiting jerseys going back decades to the all-flannel era, and a collector's look and presentation of virtually all of the commemorative jersey patches ever worn by the 30 major league clubs. The event begins at 6:00 pm at our Center City store location (137 S. 13th St - between Walnut/Sansom), with refreshments provided and in-store discounts on all authentic MLB products. We hope to you see you there, but if you can't make it we plan to tape the event to be available online.